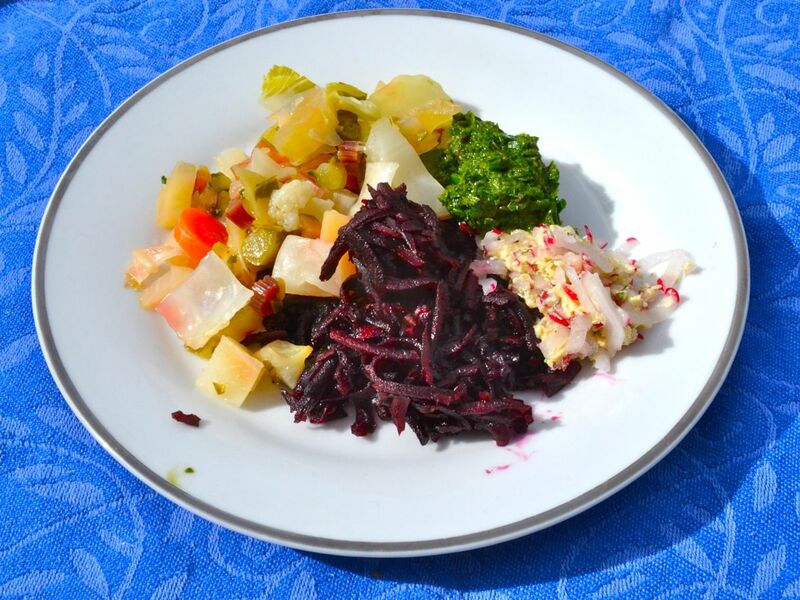 Chef Joni made some very delicious, healthy and seasonal dishes for our Fall Gardening Workshop on Saturday Oct 25 and has generously shared her recipes with us. If you joined us on Saturday we hope you enjoyed your time and your tastes with us. Joni will be cooking again this Saturday Nov 1st after the Aquaponics workshop. Hope you can make it to our garden soon. Steam this mixture until al dente, about 20 minutes. • I used a countertop “convection steam oven” (by Cuisinart, available here on Amazon), with the steam setting. • You can use a steamer basket, or bamboo steamer, for 20 – 30 minutes. • Or bake in 9×13 baking pan with tight-fitting foil, 400 degrees, 30 minutes. • Use the leaves to make pesto, see Super Green Pesto recipe. 1) In food processor, use the grating tool to process the beets and sunchokes. 2) Cook in large skillet until soft, about 10 minutes. Stir occasionally. 3) Add onions and serve w/Radish Butter and Super Green Pesto. 1) Mince the radish (in food processor), and squeeze out the juice. 2) Blend with butter, and serve. 1) In food processor, chop the leaves until small bits. 3) As the motor is running, slowly pour in oil.